Moving to Los Angeles County? 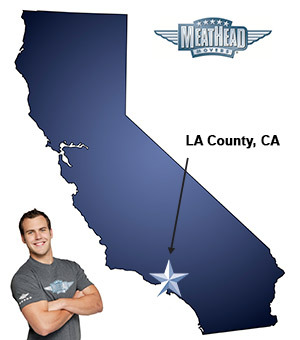 Whatever your moving needs may be, the Los Angeles County Movers from Meathead Movers will help you feel at home. Our professionally trained student-athlete movers and our moving concierge will be with you for the entirety of your move. Meathead Movers is growing its Los Angeles County movers force, and we couldn’t be more excited! The first several years we were in business, we stayed close to home with regards to the counties in which most of our moves happened. Of course, there were exceptions, like the move from Chicago to San Luis Obispo or relocating the entire corporate staff of the country’s leading guitar string manufacturer to Southern California, but the majority of our moves have been in the Tri-Counties area. It wasn’t until we opened up our Ventura County office that we began to take off as the preferred Los Angeles County movers. We quickly realized just how much we loved Los Angeles! Moving in Los Angeles County is definitely different than moving in the rural foothills of San Luis Obispo County or the suburban sprawl of Orange County. With nearly ten million residents, you would think that it would be overwhelming to service such a large market. However, we have quickly become familiar with all the unique neighborhoods in Los Angeles County and their personalities. If you are a Los Angeles County resident, perhaps you’ve seen our eye-catching moving trucks rolling down the Pacific Coast Highway. We do many moves in Malibu, and we’ve noticed that our clients there appreciate that we focus on environmental responsibility by using biodiesel, recycling tens of thousands of pounds of corrugate each year, and having a paperless sales system. Naturally our student-athlete movers jump at a chance to do a move in Venice Beach—how could they not love a place that is home to Muscle Beach? But don’t worry, when they take a break to pump a little iron at Gold’s Gym, they do it off the clock. We serve everyone from average families to TV producers and stars in Westlake Village and Calabasas. It’s always a kick to come home from a move, turn on the TV, and see the person you moved hours earlier! Being a transportation company using Los Angeles area freeways can be a little challenging to maneuver at times, however, our movers love seeing all the local landmarks ranging from the Getty Center, to the Scientology Celebrity Center, to Griffith Observatory, and of course the Hollywood sign. Whether you are off to seek fame and fortune in LA or are leaving the hustle and bustle of Los Angeles County, we are here to support you along the way. Our services range from local moving, long distance moving, packing and even on-site moving for rearranging your home/office or loading rental trucks. We know moving is stressful, but it’s our job to ease your transition. We have been revolutionizing the moving industry since 1997. When you entrust your move to Meathead, you can rest assured that your move will be a success because our professionally trained student-athlete Los Angeles County movers are the best movers the industry has to offer. If you want a guaranteed price from our Los Angeles County movers for you upcoming move, get free moving quotes today. Moving to Los Angeles County? Here are some helpful resources. View more Los Angeles County resources. Excellent job and we really appreciate your follow up staff listening to our concerns. None of my furniture was wrapped, except for what I wrapped myself. They did not assist in taking apart the bed or re-assembling it at the new house. They broke several of my items including plastic storage bins, every single glass item that I owned (that I had packed carefully still arrived broken), almost all of my makeup palettes (mostly limited edition and not able to be replaced) were totally shattered and destroyed. All of my (white) furniture since it was not wrapped has black scuff marks and scratches from being loaded in the moving truck and moved without protection. The only piece of furniture that was not ruined is my bed that I took apart and wrapped carefully. The movers didn't wrap or protect ANYTHING! They also didn't move everything, because they kept complaining about time. So I had to spend the rest of the weekend making several trips in my 2 door sports car to move the rest of the items. When they brought boxes into the new place they just kept piling them, not even asking where they should go (even though they were all clearly labeled with color coded stickers that had the room name), so I had to stay upstairs and move the boxes after the movers brought them in and move everything myself to keep it organized. If my husband hadn't helped them load and unload the truck the movers probably would have taken another 4 hours to finish up. I am speaking with my attorney to go over our arbitration options regarding all the broken and destroyed glass, makeup and furniture. I have never had such a horrible moving experience and I will not use this company again, or recommend them to anyone. I am livid! Friendly staff, quick service during move!